AG Machining supplies complex assemblies to companies in the aerospace, medical device, pharmaceutical, technology, and industrial controls industries. 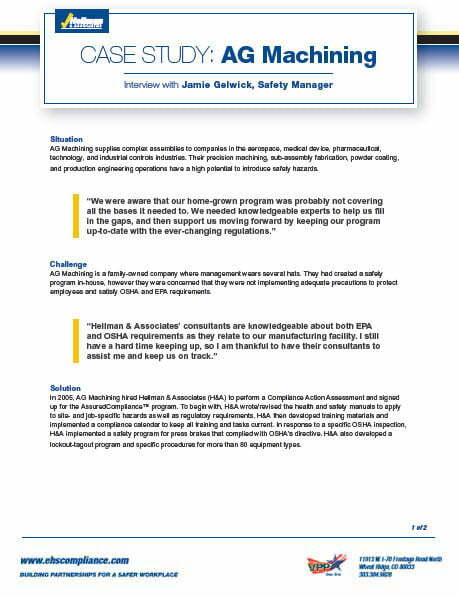 Their precision machining, sub-assembly fabrication, powder coating, and production engineering operations have a high potential to introduce safety hazards. Coblaco Services, Inc. is a Colorado-based industrial coating company that has accrued more than 10 million work hours over the past 30 years. Coblaco and its subsidiaries have completed more than 500 projects in the public and private sectors, including major league sports stadiums, power generation plants, food and beverage plants, bridges, and dams. Their facilities and operations are subject to government regulations and they are often required to produce safety credentials in order to bid on large projects. As a general contractor, Dohn manages multiple construction projects with specialty-trade subcontractors working under their supervision. They had been working with a safety consultant, however the training materials had become dated and stale, and they questioned whether the consultant had become equally complacent in other areas. Under OSHA’s Multi-Employer Citation Policy, Dohn can also be held liable for safety violations by subcontractors. They needed a partner they could trust to keep their workers and worksites safe. Retailers often struggle to maintain compliance across multiple locations. 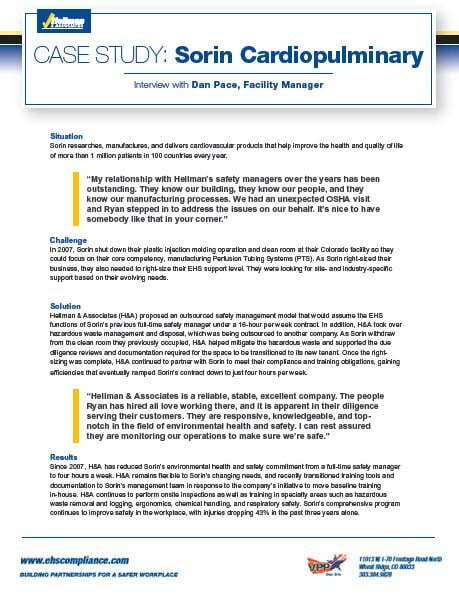 Having dedicated Environmental Health and Safety (EHS) staff at each site is impractical, yet managers or supervisors tasked with these duties may not have the time or training to stay on top of safety regulations. This puts their employees and their company at risk. 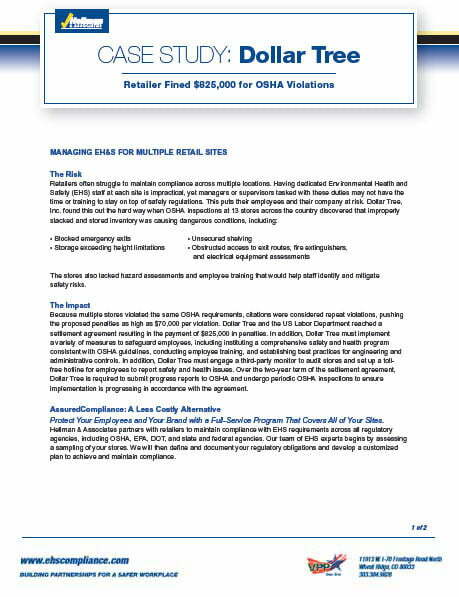 Dollar Tree, Inc. found this out the hard way when OSHA inspections at 13 stores across the country discovered that improperly stacked and stored inventory was causing dangerous conditions. LPR provides industrial construction and steel erection services across the United States. They have built a number of well-known public structures, including Colorado Rockies stadium, Denver Art Museum, and Atlanta Braves baseball stadium. First VPP-certified in 1998, LPR was the first construction company in Colorado to achieve VPP Star Site status and is proud to be the longest consecutive VPP member in Region 8. For over 90 years, Noffsinger Manufacturing has been providing the agricultural industry with belted chains, hook chains, wire belts, rollers, and sprockets that assist with harvesting, sorting, separating, conveying, and processing crops. 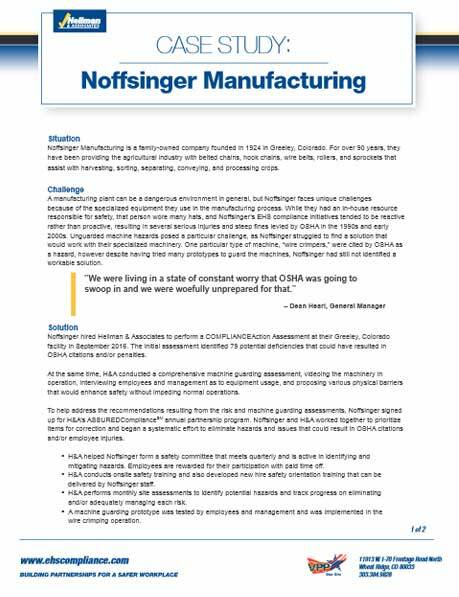 A manufacturing plant can be a dangerous environment in general, but Noffsinger faces unique challenges because of the specialized equipment they use in the manufacturing process. OldCastle Infrastructure is one of North America’s largest manufacturers of utility and construction products for telecommunications, energy, transportation, building structures, and water markets. They have 80 locations and nearly 4,000 employees across the United States, and hold safety as their #1 value. 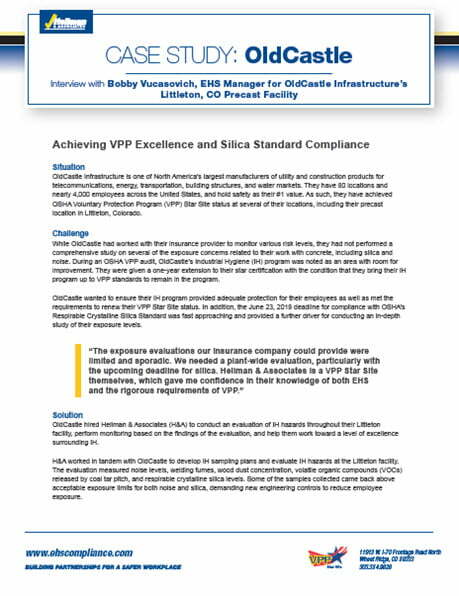 As such, they have achieved OSHA Voluntary Protection Program (VPP) Star Site status at several of their locations, including their precast location in Littleton, Colorado. Sorin researches, manufactures, and delivers cardiovascular products that help improve the health and quality of life of more than 1 million patients in 100 countries every year. In 2007, Sorin shut down their plastic injection molding operation and clean room at their Colorado facility so they could focus on their core competency, manufacturing Perfusion Tubing Systems (PTS). 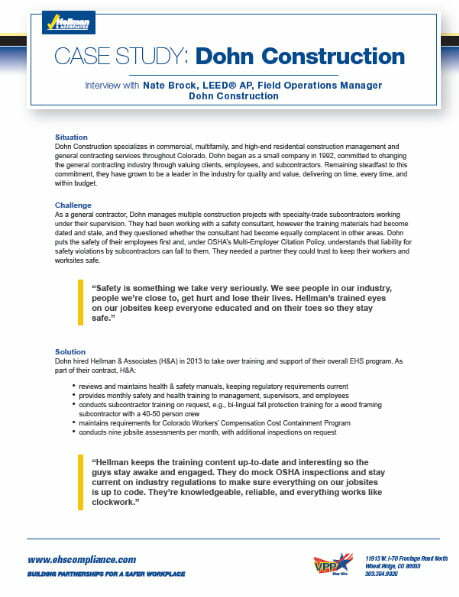 As Sorin right-sized their business, they also needed to right-size their EHS support level. They were looking for site- and industry-specific support based on their evolving needs. Spectrum General Contractors is a second-generation, family-owned firm that started more than 40 years ago in downtown Denver. It has since grown to over 50 employees. Spectrum’s creativity can be seen all over Denver, from commercial projects to adaptive reuse and historical restoration. 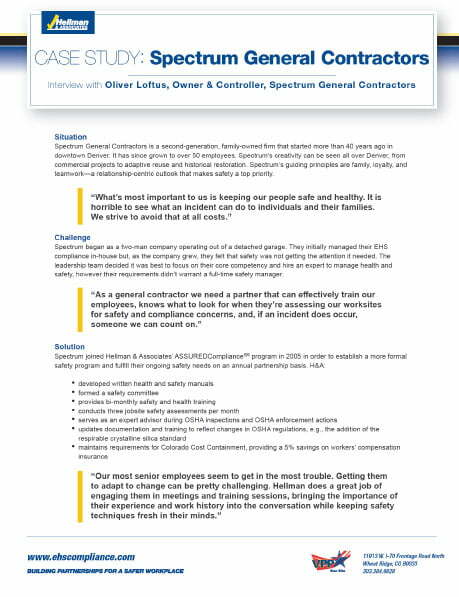 Spectrum’s guiding principles are family, loyalty, and teamwork—a relationship-centric outlook that makes safety a top priority. They have been an ASSUREDComplianceSM client since 2005.